The Network: Damaging Australia's reputation: the dab hands of the financial & banking system, the politicians and the military. Damaging Australia's reputation: the dab hands of the financial & banking system, the politicians and the military. ... and, Networkers, just in case you thought it was only the politicians who are damaging Australia's reputation with corrupt activity (see link in last sentence about paying people smugglers), here is our wonderful banking system on display. 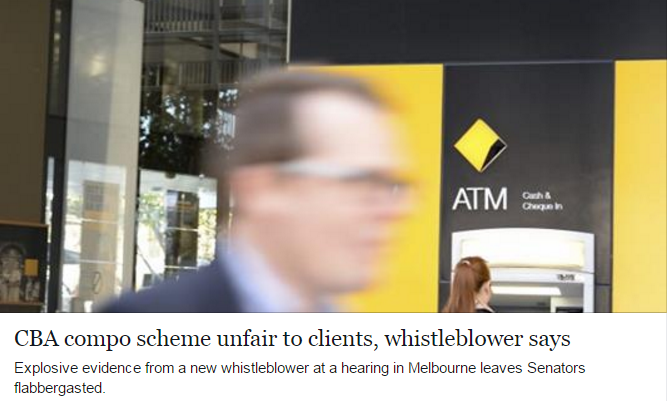 Of course, the Commonwealth Bank​ is not alone. The organisation at the pinnacle of Austrailia's financial system, the Reserve Bank of Australia, has its problems as well. Recall the Securency scandal. And then you may also recall the NAB​ scandal. And the ANZ scandal. And then there is Westpac and to top it all, the cream on the cake (so to speak), the millionaires club of Macquarie Bank. So - wotcha reckon, Networkers? Are all those previously referenced descendants of Ned Kelly​ or do they make Ned look respectable? Just remember - these people hide behind a cloak of financial and business respectability ---- and they are trashing Australia's reputation. To further explain how our politicians - and our military - are damaging Australia's reputation, Amnesty International has a lot to say.